​We are pleased to roll out our new customer loyalty program, Mega Rewards! This MegaHobby.com Loyalty Rewards Program is designed to reward you for shopping with the MegaHobby.com family, at no extra cost! To earn Mega Rewards, all you need is a customer account on the MegaHobby.com website and to place an order while logged in. One point per dollar spent will be added to your rewards account. It’s that easy! 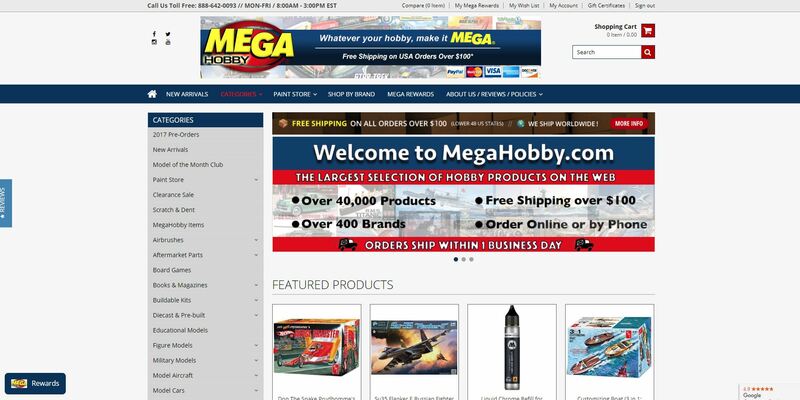 To access the Mega Rewards dashboard, click on the “My Mega Rewards” link at the top right bar on any page on the Megahobby.com website or click the blue "Mega Rewards" box at the bottom left of the screen. A window will pop up where you can see how to earn points, how to redeem points, and your points balance. When you earn points by making a purchase, you will receive an email confirmation letting you know your new balance. You will also receive an email when you redeem points, to either confirm your redemption or to provide you with your coupon code. Although placing orders on the MegaHobby.com website is the easiest way to earn points ($1 spent = 1 point earned), there are some other ways you can also accrue points. You can redeem your points in the form of a coupon code to be used on your order, or you can receive a store credit to your customer account which can be used as a payment method at checkout. You can also redeem any value of points over 1,000 for a store credit on your account. A coupon code is emailed to you and can be applied to your order at checkout as a one-time discount. A store credit sits in your customer account and can be used as a payment option at checkout. Since the MegaHobby.com website currently allows just one coupon code to be used per order, we recommend you redeem your points as store credit if you have an existing coupon code that you would like to use on the same order. 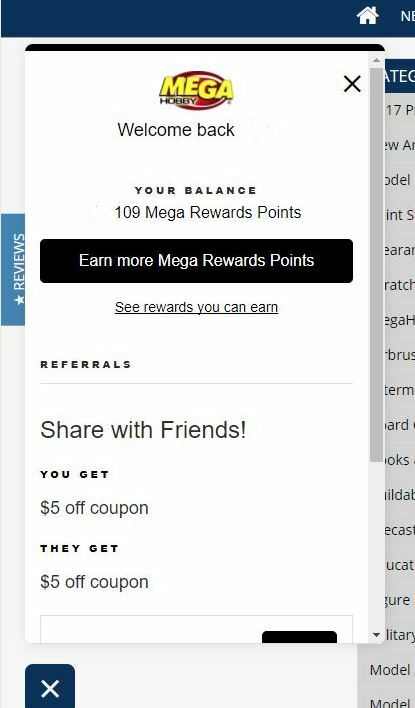 You can also earn a $5 reward certificate for a friend and yourself by referring them with the link in your Mega Rewards module. Note that you will only earn the $5 reward for yourself after your friend places an order. If you have any questions or comments about Mega Rewards, feel free to contact us any time at 888-642-0093 or info@megahobby.com. We are very excited to be able to give back to YOU, our loyal customers, by rewarding you for your loyalty. Thanks as always for your support and for being a part of the MegaHobby.com family! Mega Reward Terms: The Mega Rewards program is a rewards program meant to reward customers for shopping with MegaHobby.com. The Mega Rewards program is subject to change at any time without notice. Rewards points contain no monetary value and cannot be traded for cash or a refund. Points are rewarded when an order is shipped. Points for posting a review are only awarded when that review is posted through the mail after purchase e-mail sent 17 days after an order is placed. Points must be redeemed on the website to be used and cannot be redeemed after an order is already placed and/or shipped. Points are rewarded based on the subtotal of an order, and does not include shipping, tax, or coupon codes. MegaHobby.com reserves the right to deduct points from a customer’s account for reasons such as, but not limited to, cancellation of an order, customer return, or misuse of the Mega Rewards program. 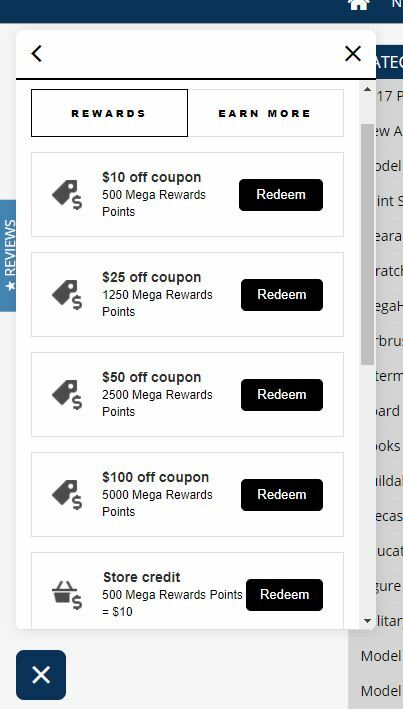 Mega Rewards cannot be earned for purchasing gift certificates. Sorry, MegaHobby.com will not refund the value of a coupon code that was not entered at checkout.